Dawn, 6 November 1865: The CSS Shenandoah steamed up the Mersey River through heavy morning haze with the Confederate flag flying at the peak and dropped anchor near Liverpool guard ship HMS Donegal. Customhouse officers boarded and granted entry. A lieutenant from Donegal visited, providing what Captain James Waddell recorded as “official intelligence” of termination of the war: “He was very polite toward me, and left me to believe he felt a sympathy for us in our situation.” The last Confederate banner (second national pattern) was hauled down without ceremony about 10 a.m.
Waddell did not consider that he had any right to destroy the ship or any further right to command her, and because Confederate States’ property had reverted by fortune of war to the government of the United States, this vessel should also. “I therefore sought this port as a suitable one wherein to ‘learn the news,’ and, if I am without a Government, to surrender the ship with her battery, small arms, machinery, stores, tackle, and apparel, complete, to her Majesty’s Government for such disposition as in its wisdom should be deemed proper.” The captain did not mention that he and his fellow Southern officers had no desire to submit their persons to U.S. jurisdiction; for all they knew, a pirate’s noose awaited. The Admiralty ordered Captain Paynter of Donegal to prevent Shenandoah from coaling or leaving the port. Having interviewed Waddell, Paynter did not anticipate any such move but would take no chances. The coast guard was notified and artillery batteries in the North Fort at the river entrance were put on alert. Custom authorities returned later in the day to take possession of the ship. Paynter instructed that no one, officers or crew, was to leave until further instructions were received from London. He ordered Lieutenant Cheek commanding the steam gunboat Goshawk to lash his vessel alongside Shenandoah with boiler fires banked. With fresh provisions from shore, officers and crew relaxed; good spirits prevailed the next morning as they lounged through the day watching steamboat loads of people cruising by to gawk “as if we were wild beasts.” Chew noted, “[We] banished all thoughts of our condition from our minds. I thought, let us eat, drink and be merry for tomorrow we shall be given up to the U.S.?” But time began to pass wearily; boredom and restlessness took over. Shenandoah’s arrival in the Mersey rekindled extreme American anger over British support of Confederate commerce raiders, particularly the CSS Alabama, and now generated a slew of correspondence around the British government—up to and including cabinet ministers—concerning how to proceed. Primary questions concerned ownership and disposal of the vessel and status of officers and crew. With fervent hopes for a quick and quiet resolution, the foreign minister turned to the law officers of the Crown. Government and press were highly chagrinned at this reminder of the recent unpleasantness, complicating already strained relations. By the third morning, Wednesday, 8 November, there still was no news from London and no more fresh provisions either. “The thing is being pushed too far now,” complained South Carolinian Doctor Charles Lining, the ship’s surgeon. Chew considered this day ten times worse than the last: “I began to think seriously that we would have to stand a trial in an English court.” Around dusk, guards were doubled; the dingy was hoisted onto the deck of the gunboat, and orders issued that no boats would come alongside Shenandoah. The only exit was across the deck of Goshawk with armed sentries posted. Shenandoah officers sat at supper in the wardroom when a shout was heard on deck as a steam launch bumped alongside with Captain Paynter on board. Paynter entered Waddell’s cabin and asked the former captain on his honor whether he was aware of British subjects among the crew. Waddell assured Paynter that he was not and that he had no evidence, certificates of birth, or nationality tickets, to prove nationality. They were “a desperate and motley set of men,” he said, who had been picked up on the high seas and who ran the risk for high wages and prize money. Paynter proceeded to the wardroom and inquired if any of the officers were British subjects. They were not, nor did they think any of the crew were. Paynter requested that the crew be mustered. (One sailor later testified that the captain sent marines among them saying that they all were to be Southerners when their name was called. Waddell denied it.) Each man passed before Paynter. Most stated—many in English, Scottish, or Irish accents—that they came from one or other of the Southern states. Some were Sandwich Islanders, a few Portuguese, with a smattering of other nationalities. None acknowledged being British, and they appeared to be in a very excited state at having been held on board without reason or authority. Paynter then read out orders from London that all were to be released who were not British subjects. “With what joy it was received!! The men cheered heartily,” wrote Chew. Paynter was required to justify these proceedings following pointed allegations of prevarication from Minister Adams. The British captain vented his spleen: It was nearly impossible, he explained, to ascertain with certainty the nationality or birthplace of such seamen. The enormous shipping trade with America and the facility with which American naturalization papers could be obtained obscured the issue, while the dress, style, and habits of these mongrel crews—including Yankee drawls and swaggering gaits—were complete disguises. He was a British officer accustomed to the uniform and clean appearance of British men-of-war’s men. “I trust I may be pardoned . . . if I could not pronounce on my own responsibility whether some of the dirty, drawling, ill-looking, grey-coated, big-bearded men, who passed before me as the crew of Shenandoah, were British subjects or American citizens.” Furthermore, it might be presumed that any British subjects already had made their escape and, he believed, would have had every assistance from those on board in doing so. Thomas Dudley, U.S. consul in Liverpool, compiled a list of Shenandoah personnel with places of origin. Of 137 persons named, 55 percent (75) were English (46), Irish (14), Scotch (10), Canadian (3), or Welsh (2). Crew members, including most warrant and petty officers, had in fact been surreptitiously recruited in London, Liverpool, and Melbourne, and others from captured ships. Only the commissioned officers and a few others were Southerners. So, quite a few subjects of the Crown walked off. It also would have been highly inconvenient for the British government to witness public prosecutions of its subjects in the heat of ongoing controversy. Minister Adams, supported by a scathing (and somewhat inaccurate) letter from Secretary of State Seward, rehashed their vociferous complaints of British complicity in rebel piracy during the conflict. Foreign Minister the Earl of Clarendon voluminously countered these allegations as having no basis or evidence in international or domestic law. No American minds were changed, however, as they prepared litigation that would lead to subsequent award for the United States in the so-called Alabama Claims. Shenandoah was second only to Alabama in determining British liability. 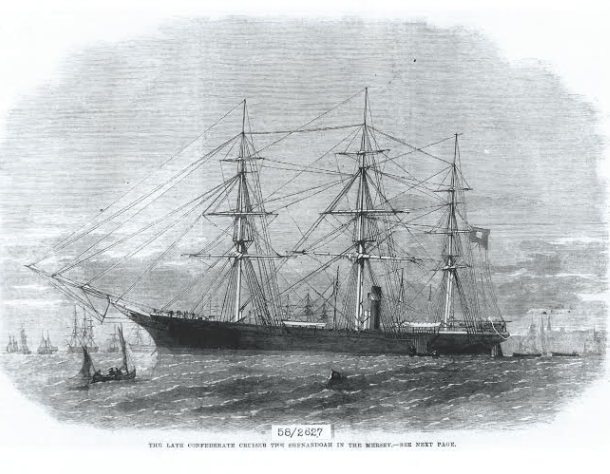 This article is extracted from A Confederate Biography: The Cruise of the CSS Shenandoah, to be published by the Naval Institute Press on December 15, 2015 (aconfederatebiography.com). James I. Waddell, “Extracts from notes on the C.S.S. 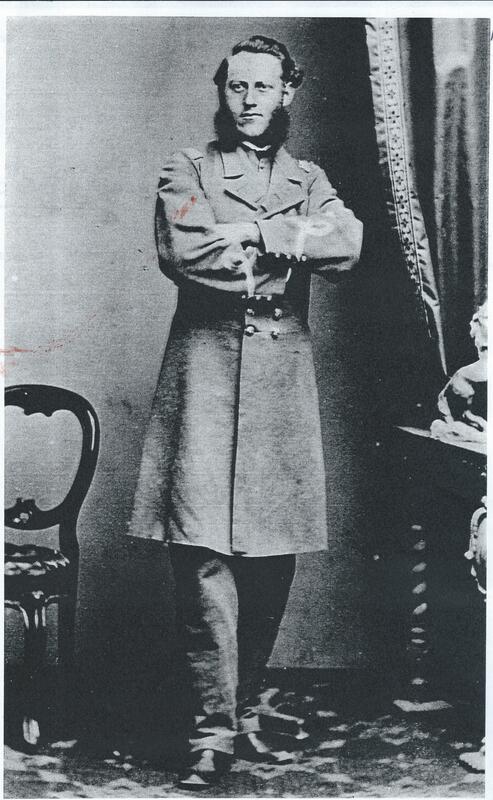 Shenandoah by her commander, James Iredell Waddell, C.S. Navy,” in The Official Records of the Union and Confederate Navies in the War of the Rebellion (Washington, D.C.: U.S. Government Printing Office, 1896), (Hereafter cited as ORN), 1, 3:835. Waddell to Russell, ORN, 1, 3:783–84. Letters, The Case of Great Britain as Laid Before the Tribunal of Arbitration Convened at Geneva, 3 vols. (Washington, D.C.: Government Printing Office, 1872) (Hereafter cited as Case of Great Britain), 1:928–34. Francis Thornton Chew, “Reminiscences and Journal of Francis Thornton Chew, Lieutenant, C.S.N.,” Chew Papers #148, Southern Historical Collection, University of North Carolina Library (not paginated), 6 November 1865. Adams to Clarendon, Case of Great Britain, 1:937–38. Charles E. Lining, Journal, Eleanor S. Brokenbrough Library, Museum of the Confederacy, Richmond, VA. (not paginated), 8 November 1865; Chew, “Reminiscences and Journal,” 8 November 1865. Law-officers to Clarendon, Case of Great Britain, 1:938–40. Paynter to the Admiralty, Case of Great Britain, 1:953–54. Temple, Case of Great Britain, 1:974; Warwick to Paynter, Case of Great Britain, 1:989–90; Chew, “Reminiscences and Journal,” 8 November 1865. Paynter to the Admiralty, Case of Great Britain, 1:953–54; Paynter to Admiralty, Case of Great Britain, 1:988.
 Letters, Case of Great Britain, 1:963–98. Chew, “Reminiscences and Journal,” 8 November 1865. Lining, Journal, 8 November 1865; William C. Whittle, Jr., “The Cruise of the Shenandoah,” Southern Historical Society Papers 35 (1907), 258. Waddell, “Extracts,” ORN, 1, 3:836. This entry was posted in Campaigns, Civil War Events, Leadership--Confederate, Navies, Sesquicentennial and tagged C.S.S. Alabama, C.S.S. Shenandoah, Charles Francis Adams, Francis Chew, James Waddell. Bookmark the permalink.